Did you know that there are really only two kinds of people? Well, there are. One kind are globalists, who believe in a overarching hierarchy of things, with all people and things with each in its place and, axiomatically, problems arise from people and things being out of place (or unhappy with their place). The other kind are universalists who think that basically everybody is equal, with everyone and everything having direct access to participate in life and society and problems arise when people and things are denied equal treatment. While there are degrees of each, these are very obviously mutually exclusive positions. Guess which side DJ /rupture’s music falls on? The latter, or course. Minesweeper Suite is a DJ mix album that splices together music from around the globe, putting it all on an equal footing. In a way, this is precisely the kind of thinking explored in Michael Denning‘s book Noise Uprising, about music in the early days of electrical recording technology. 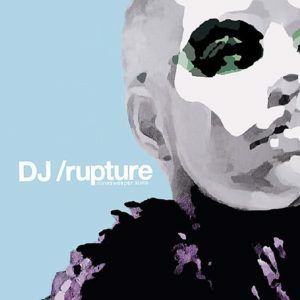 DJ /rupture (born Jace Clayton) looks for connections between music from different parts of the planet, and opportunities for complementary mappings for the beats and melodies and timbres. So, in a way, this is music that seeks to locate a universal folk music, inclusive of, well, everything (sort-of). It maybe stops short of including all kinds of music — this is mostly the music made by and for the poor, the humble, the minority, and those outside the grip of hegemonic global media, which translates to the music of the Global South. But isn’t that precisely what somebody interested in universalism would do, break from the globalist system that imposes a narrow band of “mainstream” music on everyone else? The alternative to all that that Minesweeper Suite presents is a rootless music that easily floats among many possibilities. Whatever bits of “mainstream” music are included in the mix tend to get no special privilege, but are also given honorable and supportive treatment. “DJed music develops in the great centers: London, New York, Paris. But the artists make much of their living in forays to the periphery. To state culture bureaus, our music sounds like art and the ‘avant-garde,’ a means of prestige. To kids coming of age in a world of technology and unhinged capitalism, our music seems to sound the way global capital is—liquid, international, porous, and sped-up. As for the specifics of the music, there is a lot of Jamaican stuff, Indian, North African, and old and new American R&B and soul. The bass tends to feel loud, to the point of developing a round, liquid and kind of giggling effect, with a noisy, overdriven edge. At times it creates a foreboding quality, almost like the good parts are buried under a impossibly massive and impenetrable deluge, though most of the time the music has a hopeful quality that looks toward promising possibilities. You can download this album (and others) for free from DJ /rupture’s web site.